Corporate News Keeping a cool head at logistics, is vital to export success for SAFE. COOL : Chantelle Thompson keeping cool calm and collected. 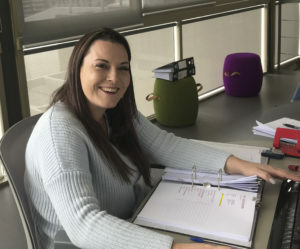 Coping with stress, a clear sense of timing and an uncanny ability to keep your head when, as poet Rudyard Kipling wrote “all about you are losing theirs” is just part of the everyday routine for SAFE Logistics Manager, Chantelle Thompson. “In this job, hands-on experience is as critical as keeping up-to-date with legal and logistics requirements. These change rapidly in the fruit export industry, so I have to read up on new laws, regulations and protocols, as well as to perform my logistics tasks daily,” says Chantelle, who has been with the company for 15 years. According to Chantelle, the cutting edge Openbravo open source enterprise resource planning (ERP) software implemented by SAFE has made the entire logistics environment more accurate and more immediate. “We are now able to track production, packing, and shipping as well as delivery to the ports of destination at a detailed level, in real time”. “The records of each day’s stock are imported into the Openbravo system and checked to see if the produce is being packed according to the programme. “Estimates can change from one day to the next, depending on weather conditions or other issues. Based on what is actually happening, we constantly do variations on the stock,” says Chantelle. “From there, we look at the shipping options. We constantly need to consider charter times and freight rates, so we are continually monitoring the shipping websites to see what options are available. “We send weekly forecasts to the shipping companies, telling them what we plan to ship, taking into account freight rates and transit times, which vary enormously from one line to another. “The shipping lines could also have glitches that need to be considered, such as strikes at the ports and weather conditions. In Cape Town, for instance, the grape harvesting season coincides with the southeaster – which can impact on our export plans. “Loading times can easily be pushed out for as long as a week. This affects the landing times at the ports of destination and if there is a delay we have to budget for extra storage costs before the produce can be loaded. “We also talk to the storage depots in Cape Town, Durban and Port Elizabeth daily, let them know when we plan to load, what produce to expect and how it should be loaded. We also stipulate the temperature demanded at loading and specify the markets for which the fruit is destined. Chantelle says there are quite often delays between loading and offloading, which changes the landing date, so an important part of her job is to constantly track the progress of the containers on the water to keep clients informed so that they can update their sales planning. In spite of all the stress her job attracts, Chantelle loves her job. One of the best things about working at SAFE, she says, is the company culture that encourages employees to function as they think fit, provided they work within the broad company framework and assume full responsibility and accountability for their actions. Chantelle grew up in East London. When not overseeing the shipment of fruit to global markets, she spends time with husband Paul, and children – Katherine (17) and Christopher (8). “They are my best buddies,” she says.